Of all the places I visited in the past two years, Costa Rica must be the ultimate favourite – possibly because I had more than 5 rushed days to soak up every little bit of information I could gather and had time to actually relax, lean back and let the experiences drizzle down on me like warm summer rain. Or heavy tropical rain showers – that depended on the day. I had three weeks to explore and discover. I wanted to see as much as possible, but Costa Rica is so diverse and soon I realised that I couldn’t go everywhere at once. I had to get a first overview before coming back another time and dig deeper. 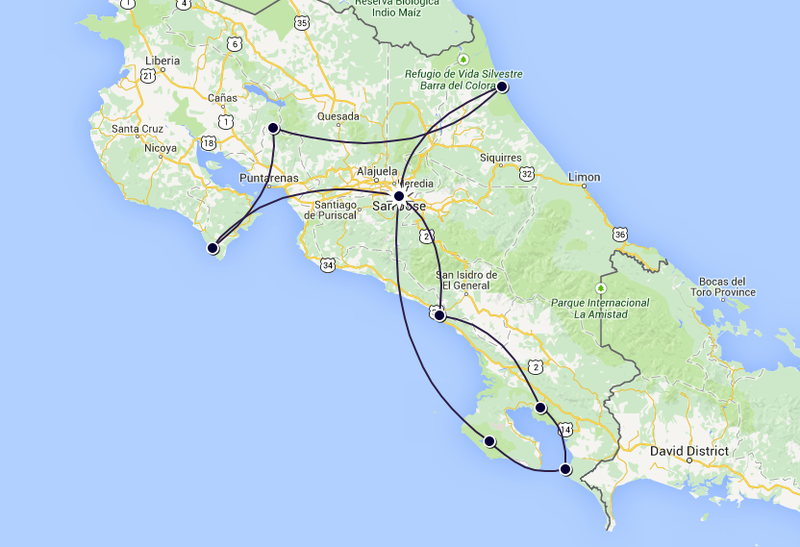 To make this easier for you, I give you the Travelettes Itinerary for Costa Rica. 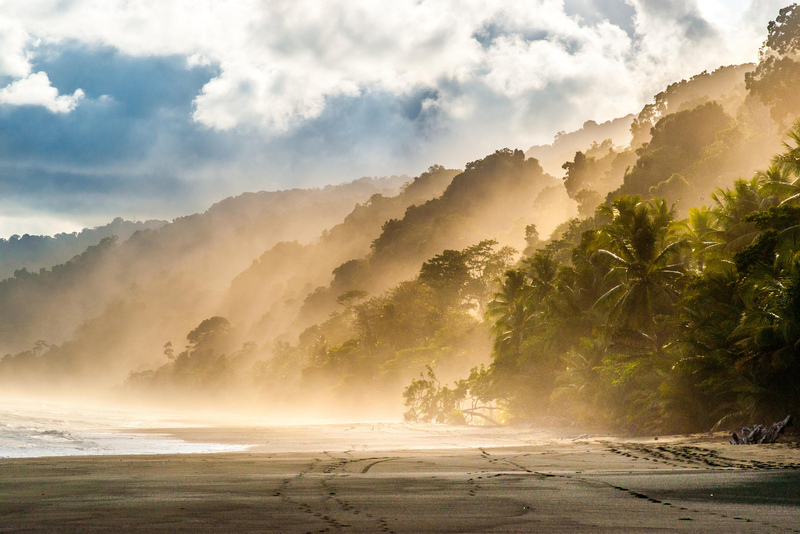 Is Costa Rica for you? 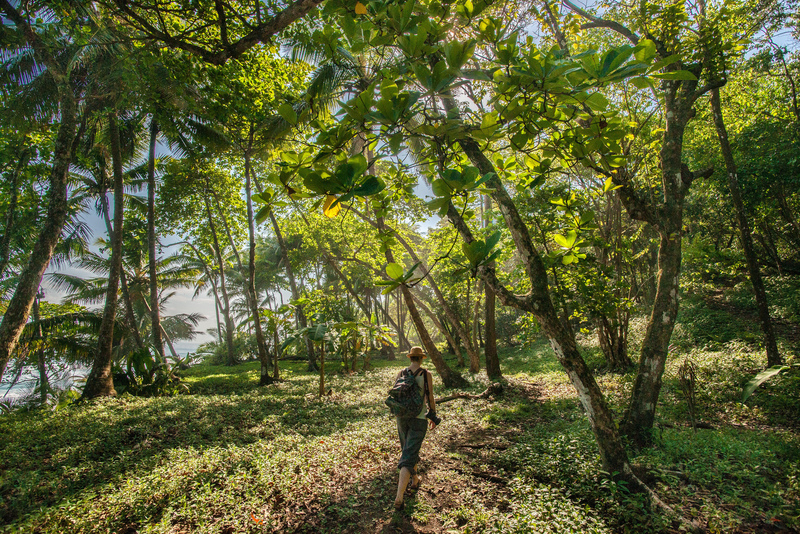 A 3-week-long journey through the rain forests, surf spots and surprises of Costa Rica. If you fly in from abroad, Costa Rica’s capital San Jose will most likely be the first place you will see. Not that the town centre wouldn’t be worth an afternoon of strolling, it’s just not the best way to start a trip to remember. If you arrive after dark (like me) find accommodation for the night close to the airport – I was very happy with Hotel Posada Canal Grande in Santa Ana, especially the view I woke up to and the yummy breakfast. The next morning we headed west to the Pacific coast. 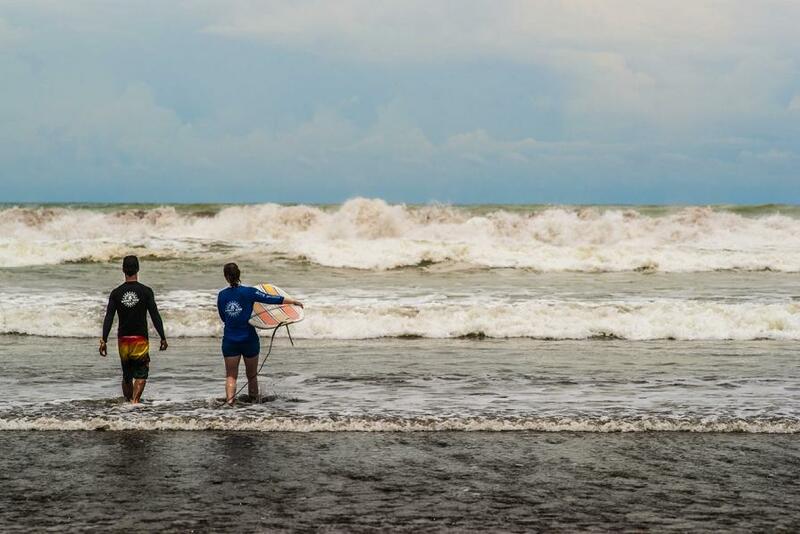 Dominical is a small but popular surf town about 3 hours drive along the coast from San Jose. For a delicious lunch quickie stop at Mono Verde in Jaco. 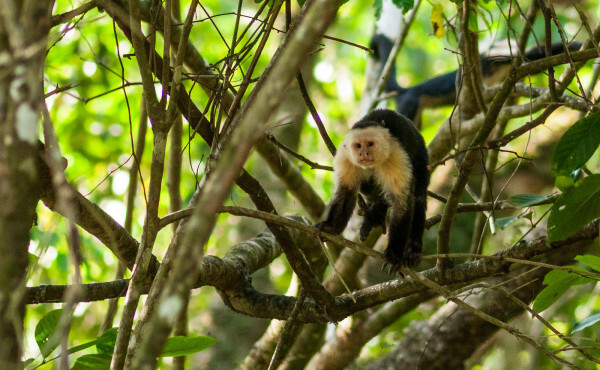 Leave Costa Rica’s most frequented national park Manuel Antonio behind (it’s only really interesting if you only have 4 days or so) and continue further south. Dominical is not much more than a small village off the main road (still with dirt tracks when I visited), but there is a bank, a supermarket, a couple of hostels and hotels, restaurants, beach bars, a yoga studio and most importantly surf schools. 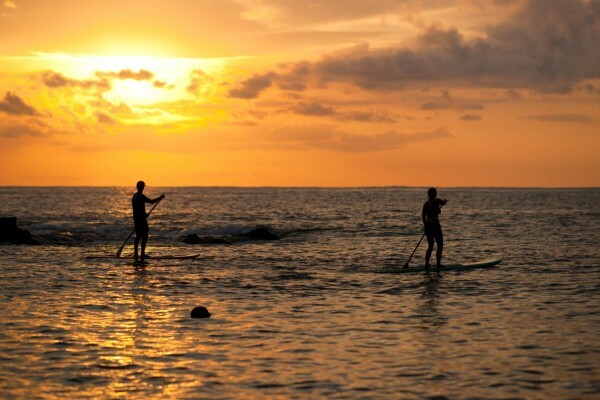 Sunset Surf Camp is great to get an introduction to the sport or improve your skills, but there are plenty of other activities to fill your days – zip lining, horse-back riding or jumping off hidden waterfalls. I wrote a full post on our adventures here. 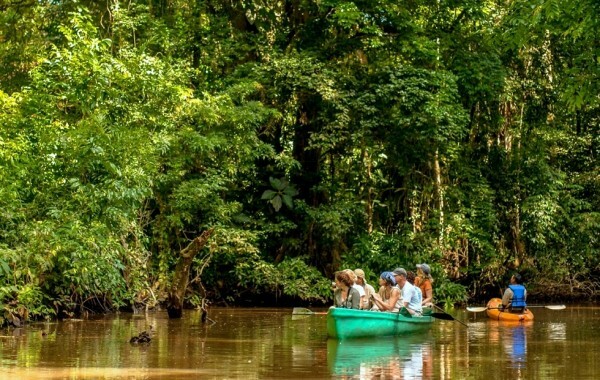 Costa Rica takes a lot of pride in being one of the leading countries in eco-tourism, and its southernmost area along the Pacific coast might be the best area to learn more about saving the precious rainforest. Here lies Esquinas National Park, also known as ‘Rainforest of the Austrians’, initially former plantation grounds purchased and reforested by a private organisation from Austria. You can read more about the environmental project here. Come here to emerge yourself in nature and 100% humidity. 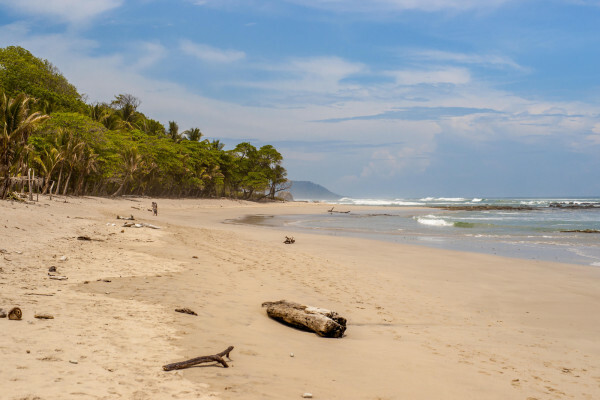 Go on nature walks, boat tours or do a day trip to Pavones, the southernmost surf spot of Costa Rica, home to the second-longest wave in the world. The drive here is rough, but totally worth it. 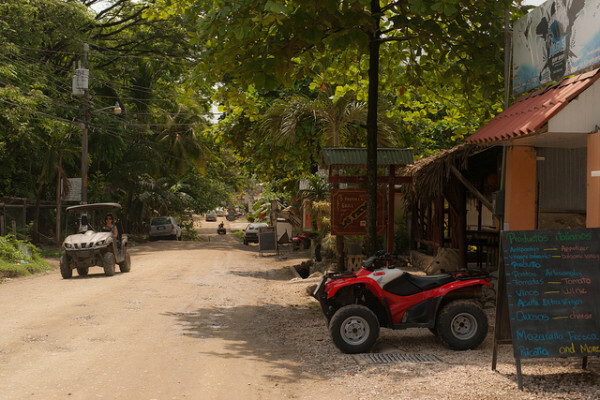 On your way into the village stop by Puntas Saleas Lodge and ask for Esteban. Not only does he know the best surf spots around, he’s also just rad to hang out with. 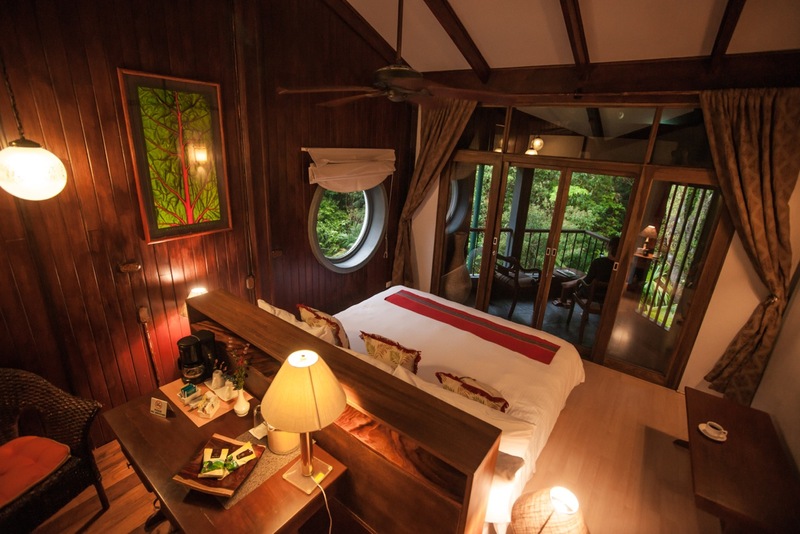 Here you can sleep in open air jungle rooms – magic! We visited Corcovado on a day trip from Esquinas, but in retrospect I would have loved to stay at least 3 days exploring the vast national park. The day trip version: Prepare for a very long day! Rise early and drive the long way to Carate (you can also take the foot ferry from Golfito to Puerto Jimenez and go on by group taxi, or fly in if you can afford it). From there it’s a 1-2 hour walk along the beach to reach the first ranger station of the national park, La Leona. As the next station is a mere 8 hour walk away, this will be as far as you get in a day. Enough beauty to get hooked! The multiple day version: Since February 2014 every visitor to Corcovado needs to be accompanied by a certified professional guide. The guide will make sure that you don’t harm the pristine environment, and that you spot the most amazing animals on the way. The couple from New Zealand proudly presented us with pictures of a jaguar – that’s when I knew next time I’d stay longer. Hiking along the two tracks (one along the coast, one leading inland) is tough , because it’s very hot and 100% humidity in the air, and accommodation is basic in bunk beds in one of the four ranger stations. For once, even the hard-bitten travelettes should take off their high heels. After exploring the Pacific southern coastline, it is time to head to the Caribbean. You can’t cross from one to the other coast in the south, because of a mountain range, national parks and indigenous reserves – so all you can do is drive back up to San Jose and cross in the north. 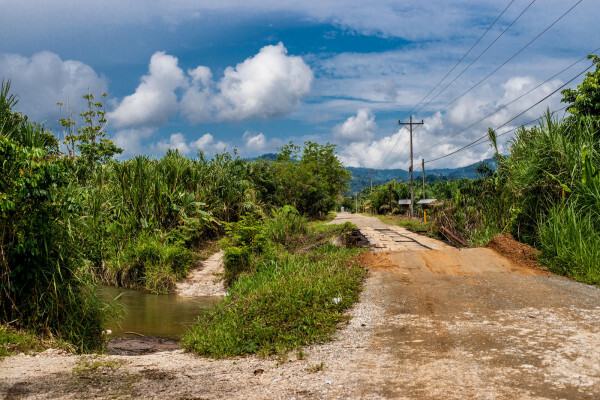 Although Costa Rica is relatively tiny on the map, distances can be very long because there are few roads cutting through the lush green, and some of them are so curvy or bumpy they force you to drive very slowly. Coming from Corcovado the best option is to have a one-night layover in San Jose. The city will get your civilisation levels further up than you might wish. Many people blend in with even more cars, street vendors and shops selling everything from fresh fruit over out-of-place fashion to souvenirs. Driving here is a nightmare, because most roads are one-ways and one wrong turn can get into places where you don’t belong. With a map and some neat orientation skills, we somehow managed to reach out city centre hotel and parked our car in a private guarded garage. The hotel room was nothing more than an internal wood-clad cubicle with a fan, but the house lord invited us to join him and the other guests for dinner in the hall and it turned out that he knows how to throw a party! After an entertaining dinner we went for drinks at the higher-end Gran Hotel Costa Rica, which all of a sudden seemed way too to impersonal with all its comfort and service… Good cocktails though! A night in the city was enough and we were back on the road to the jungle. This time we drove north-east towards Tortuguero National Park. Although the journey there is quite straight forward (car/bus from San Jose to Cariari/La Pavona, then onwards with a boat shuttle), many visitors won’t make the effort, which leaves the park quite off the beaten track. It was one of my highlights, not only because of the pristine waterways of the park, but also because of the excellent jungle lodge and its offer of activities. Read more on our adventures here. When you are here book a canoe tour with Barbara Hartung. She’s an expat biologist who knows what she’s doing and will spot some amazing animals for you – monkeys, turtles, otters and birds of all varieties. 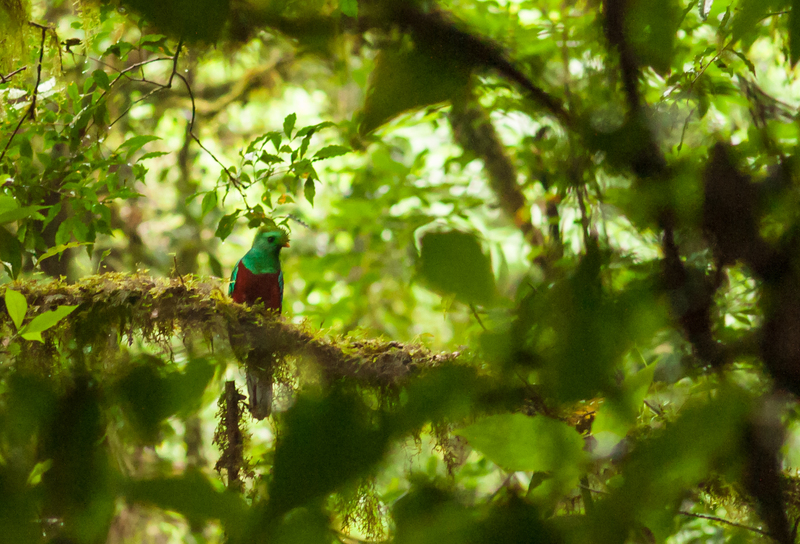 The best place to see a completely different side of Costa Rica is the cloud forest of the north-west. It lies further up and temperatures drop considerably compared to the coastal regions. Most visitors will head for Volcano Arenal and nearby Lake Arenal, which are both beautiful without a doubt, but also quite off-track and require a lot of driving. To save our precious time we decided to head to Monteverde instead, a just as popular area south of Arenal. Finally we could turn off the A/C and I could wear my (so far useless) long sleeves. 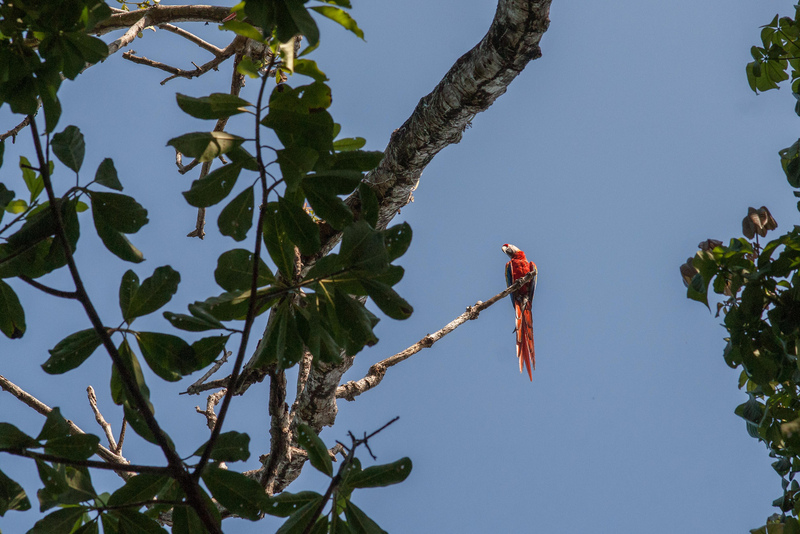 The nearby nature reserve is a great place for a guided nature walk, trying to spot a rare tropical bird like the Quetzal. 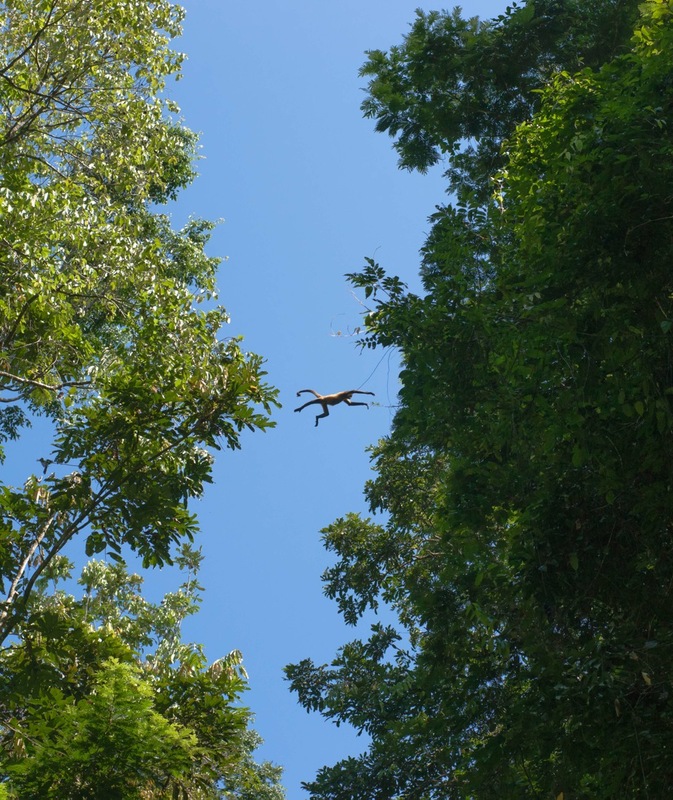 Head to a coffee and chocolate plantation to learn some and taste more; or fly down a zip line high up in the canopy. Find out more here. Finally it was time to relax and reflect on all the things we have done in the past month. 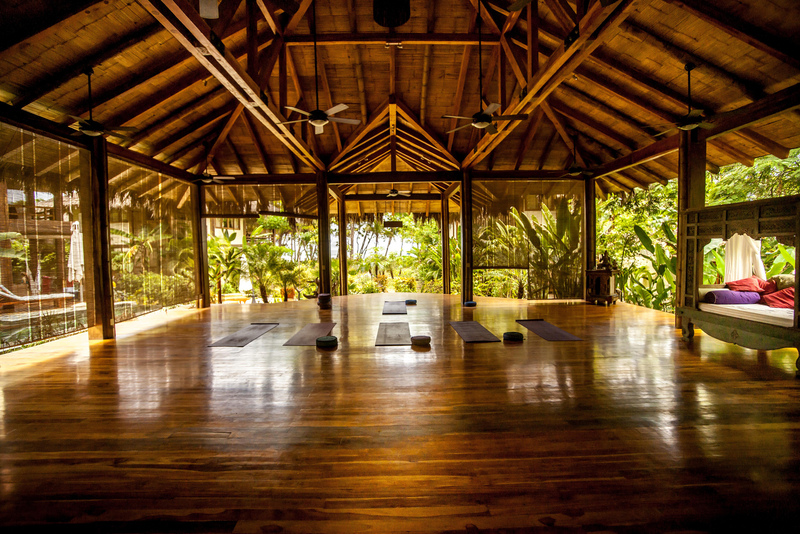 What would suit better than a yoga retreat by the beach. Santa Teresa – back on the Pacific coast – is a mecca for surfers and yogis from all over the world. 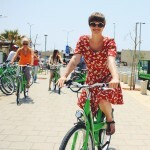 The vibe is quite international and the accommodation and services in town serve every budget. We wanted to get pampered and tried two different resorts, Florblanca – where we stayed in our private beach house and had great yoga lessons – and Pranamar – which is even more focused on holistic yoga holidays. 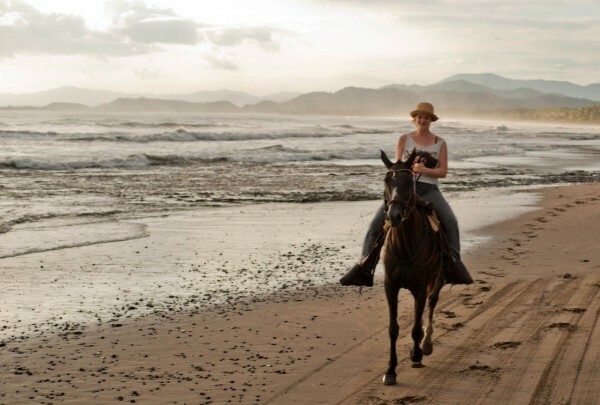 Although we could have stayed in the jungle shalas all day, we were seduced by the large variety of activities in the area – from Stand-Up Paddle Boarding to riding into the sunset on horse-back, the infrastructure in this area is definitely one of the best all over Costa Rica. Three weeks were hardly enough to see everything I wanted to, so I already have a list for next time I come back. 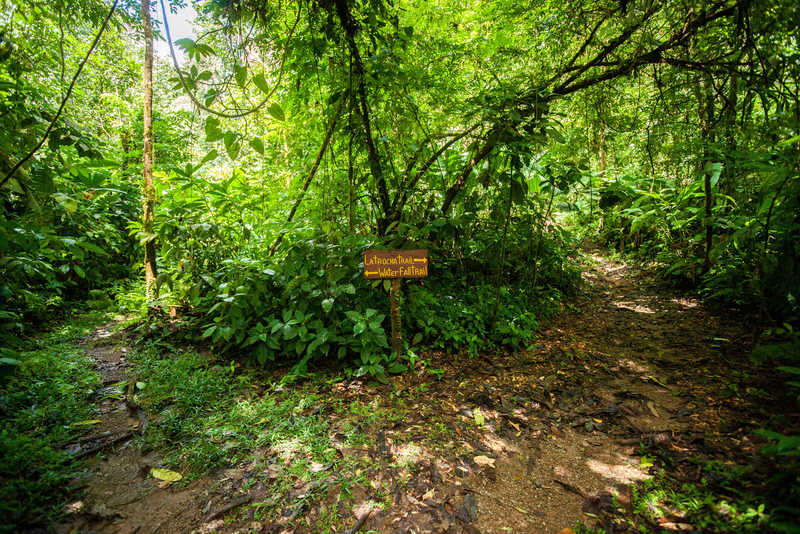 First I want to spend more time in Corcovado National Park and do a multiple day trek through the rain forest. After that I would like to climb the highest peak of Costa Rica, Cerro Chirripo, and see a sunset and both oceans from its top. 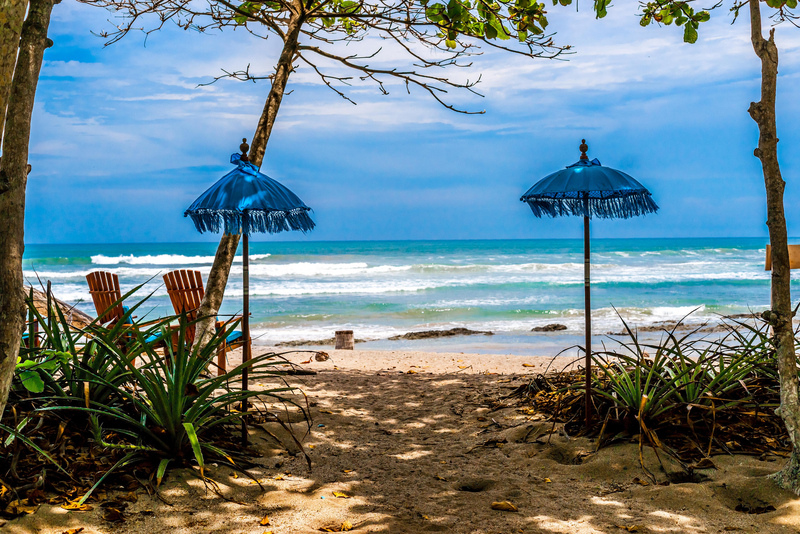 Finally, I will venture further south along the Caribbean coast and spend a couple of days relaxing and surfing in Puerto Viejo de Talamanca. Apparently that’s where many locals come for their holidays, so I need to improve my Spanish first! When to visit depends on your budget and planned activities: April to October are cheapest and there is good Pacific swell, but it’s also rainy season. December to April is dry season, so prices and demand for services is higher. We travelled in May which I found perfect, because everything is lush and green, rain is moderate and the surf is good for beginners like myself. Getting around is fairly easy on busses, but takes some time, patience and Spanish skills for haggle the price. 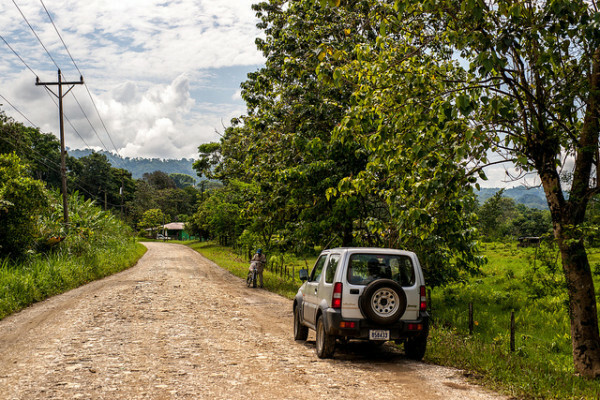 If you can, go for the comfort and freedom of a rental car – definitely 4×4 for all the dirt roads! Some places – mostly remote beaches – are hardly or inaccessible by public transport. We met a couple from New Zealand in Tortuguero whose trip from San Jose took about twice as long and multiple bus changes. Pavones is only reached by one single bus daily (from Golfito) and the road there is pure adventure – even in a compact jeep. Other places like the beautiful Playa Cuevas south of Santa Terese (a solitary beach with amazing swell) can only reached with a car and plenty of guts for the dirt track leading there. I say, invest in a rental car! Forget everything you knew about car snacks – along the road there are always fruit stands selling fresh mango, melon and coconuts. My favourite snack for the road was ‘pipa fria’, a chilled coconut opened with a machete. After drinking the coconut water with a straw, ask the shop owner to cut in in half, so you can spoon out the fruity flesh. The official currency is Colon, but US dollars are accepted in most places. So are credit cards. Ironically the only place where I had problems withdrawing cash was at the international airport in San Jose. In my experience most ATM’s accept international debit cards. I think Costa Rica has been one of my favourite trips ever. It was my first time to a rainforest, and against all expectations of not liking the heat, it seems the jungle is the one place on earth that calms me down like nothing else. I even wrote my entire master’s thesis while listening to a 1-hour rainforest track on repeat. Right now, all I want to do is pack my bag and get on a plane to San Jose. Go and see for yourself, I’m sure you will feel the same! *Photos by Brian Shaw and Kathi Kamleitner. 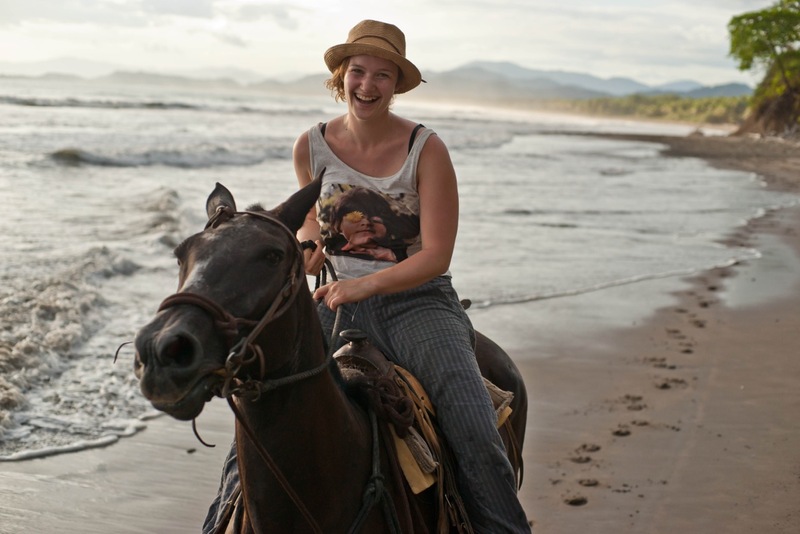 You definitely have to go to Puerto Viejo next time, it's my favourite place in the country! I missed Tortuguero and Corcovado so far (shame on me), but it's totally on my To-Do-List for the next time, which will be soon. If you have time, visit Playa Conchal on the northern Peninsula de Nicoya. The village (Brasilito) isn't really exciting, but Conchal consists of tons of seashells and it's just beautiful! Thanks so much for the post Kathi. My husband and I are off to Costa Rica next week, heading for the Pacific Northwest. Your suggestions will come in handy. so first of all thank u all for sharing ur experiences, we will definitely have ur tips close by. Do u need malaria tablets for any of the places ? Thinking mostly about the rainforest part. I didn't take any precautions for malaria when I went. I read it's really very low-risk, so I'd rather invest in a good insect repellent! if you were bitten and get a fever (could be months after) go to the doctor and let them know that you were in the rain forest - they should then check you up on malaria and dengue. but as I said, that's very rare! Ditto Manuela on Puerto Viejo. Typically, the best times to visit are September/October (if you're not a surfer.) The ocean is almost lake smooth and it tends to be the Caribbean shore's dry season. A lot of people compare the vibe to Santa Teresa. It looks really nice over there! Great article! Sounds Exciting! What would you recommend for a good, affordable, home stay kind of option? my advice : please go to Puerto Jiménez and the Corcovado Park, best experience ever! Oh! All these national park seems so beautiful! Never thought to Costa Rica as a destination but I need to put it on my list! Now that British Airways is flying direct to CR, I just booked a flight going in November. That's as far as I have got so your blog post is super helpful! I want to surf, hike and do yoga and I think I'd prefer to come and go as I please instead of booking a retreat. I have three weeks to explore. Thanks for all the links! Thank you! We have just booked flights with BA to go next Christmas for three weeks so your blog has been really helpful in assisting me with our route and itinerary! Thank you for this article! I have already visited Costa Rica last year and already want to go back for more. Hm, difficult to say as some of the hotels offered us complimentary stays, and my friend paid the rental car in full... Some of the hotels we stayed in are very expensive, but I'd say you could probably do this itinerary with less luxurious hotels for $1,500. Costa Rica isn't as cheap as other Central American countries, but you will always be able to find hostels and cheap & delicious restaurants - even in places like Tortuguero! Pingback : See a new Place each Month: 12 Countries on our 2018 Bucket List – user's Blog!